eDiscovery is a field that ALL legal professionals need to become educated in. 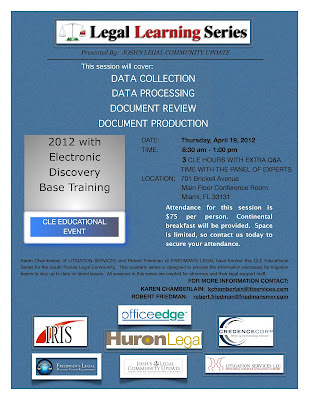 Robert Friedman and Karen Chamblain are hosting an eDiscovery training event on April 19, 2012 from 8:30 am to 1 pm. The event includes a continental breakfast, networking breaks and Q&A with their panel of experts. These are critical skills required to remain competitive. You will also receive 3 Florida Bar approved CLE credit for attending this event!! The event will be held at 701 Brickell Avenue, Main Floor Conference Room, Miami, FL 33131. The regular cost is $75 but there is a very special offer for my readers – mention code DepoJosh and save $15! THIS EVENT USUALLY SELLS OUT SO REGISTER WITH DISCOUNT CODE TODAY! To register, please contact Robert Friedman by CLICKING HERE and make sure you mention Code DepoJosh for your $15 discount. Would like to be prepared to avoid sanctions when dealing with e-discovery requests. 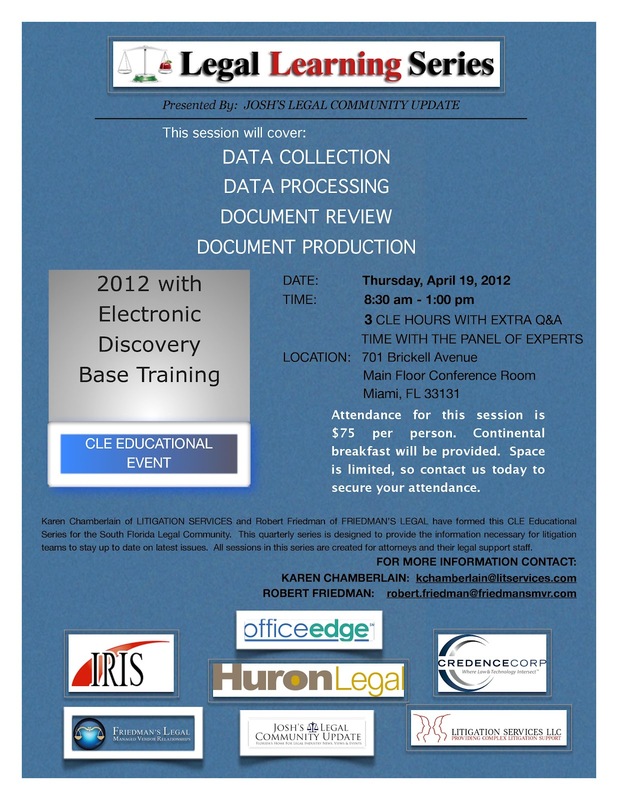 This will be a good event for IT, paralegals and attorneys that work with Electronic Discovery and want practical and useful daily advice. Additional opportunities to promote your business at this event as well as via the Legal Community Update Website are available. Contact Josh at Joshua.coller@legalcommunityupdate.com to Request Details.